One question I always ask myself is, ‘How can you create a memorial, that is supposed to instill a memory that you never had?’ When creating a memorial for such a traumatic loss, such as the Holocaust, how does one create a memorial that serves its correct purpose and remembers those lost appropriately? During our visit to Berlin, we visited several memorials commemorating different groups that suffered during the Holocaust. I found myself extremely anxious to revisit the city, because during my last visit, I only saw the The Memorial to the Murdered Jews of Europe and I realized there would be other memorial to the very tragic historical events we would be seeing in the city. Any tourist walking through Berlin would have to be completely unobservant to miss the 2,711 concrete slabs in the center of town that follow a grid-like pattern. From an outside point of view it almost seems as if you can find yourself lost in a maze, but I couldn’t help but get lost in thought. My first reaction to the memorial was whether or not it actually commemorated the murdered European Jews. At first I thought that it did not correctly memorialize the murdered Jews because it simply did not say anything about them. In one of our later class discussions about this memorial, my view was confirmed by others who were equally critical, claiming that it did not justly commemorate lives of the Holocaust victims. My view were challenged by an article by the architectural critic, Nicolai Ouroussoff , called “A Forest of Pillars, Recalling the Unimaginable”, in which the author describes the memorial and its ability to “convey the scope of the Holocaust’s horrors without stooping to sentimentality- showing how abstraction can be the most powerful tool for conveying the complexities of human emotion.” This made me rethink my highly critical analysis of this memorial and start seeing it as a thought-provoking object. In class, we spoke so much about how these ‘grey pillars’ did not bring justice to those that were being commemorated because it seemed more like a piece of art rather than a memorial. However Ouroussoff made me think a bit differently about its abstract character. Another interesting point he brought out was how the memorial was supposed to make you feel. He states: “The effect is intentionally disorienting. You are left alone with memories of life outside—the cheerful child, for example, balanced on the concrete platform.” His interpretation was important for me, because it reflected my experiences visiting the memorial and remembering walking through these concrete blocks, watching them get taller and taller, and trying to imagine a history that seemed to have remained only a memory. Another memorial that, at first, struck me as inadequate was the Memorial to Homosexuals Persecuted Under Nazism. 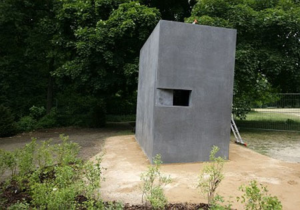 This memorial is in the shape of a concrete cube that has a window in which visitors can come and look into to see a short film of two kissing men. My initial take was very critical. The memorial seemed so powerless compared to the Memorial of the Murdered Jews. My fellow classmates seemed to mostly agree with me that the memorial does not do justice to those killed. Add in reference to article – Similarly, I tried to learn about the memorial through additional reading. I found an article by…. that explained that the single block was to be an extension to the Memorial to the Murdered Jews of Europe. 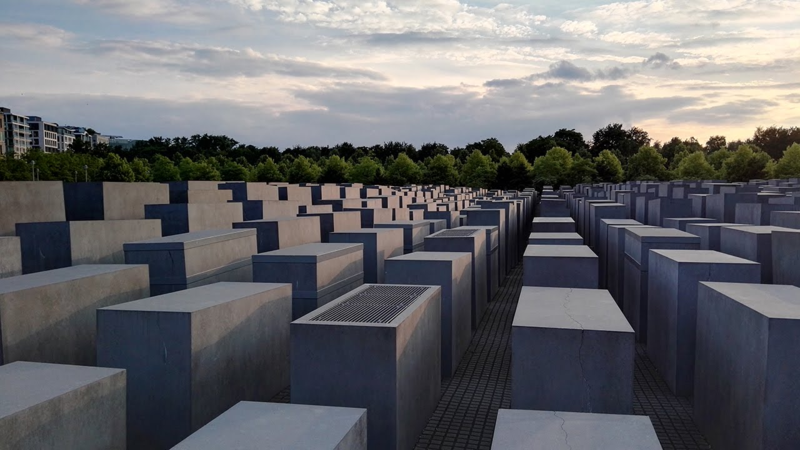 This made me notice that the two memorials looked very similar and realize that the architect probably intentionally wanted to imitate the memorial to the murdered Jews and add a separate piece to show that homosexuals constituted a group that was also persecuted by the Nazi regime. I felt like the memorial’s purpose was to shine a light on homosexuals as a group of people that was also singled out for imprisonment and murder. After visiting these memorials I continued thinking about them. I came across an article about a Jewish Holocaust victim survivor and historian explaining his view about the memorials that completely opened my eyes. He stated: “If visitors have the impression that there was not a great difference between the suffering of Jews and those of homosexuals, it’s a scandal. A sense of proportion must be maintained.” (Gutman, 2008) This encouraged me to search for the statistics of how many gays and homosexuals were persecuted under the Nazi regime. I had found out that it was estimated that 100,000 men were arrested and about 50,000 were officially sentenced. Out of the 50,000 most of them served in regular prisons and a rough 5000-15000 were sent to Nazi concentration camps. When comparing these numbers to the numbers of Jews killed (around 6,000,000) this number seems miniscule. Of course one should never compare numbers when it comes to such matters, but I think that this is the point that Gutman as a Jewish Holocaust survivor meant to bring out. Visiting and thinking about these two Berlin memorials was important for me, because they taught me the need to approach such public works critically. Often people love the memorials that give a complete story and explanation as to why they are there. I feel like the memorials that say the least, can actually affect the most. It is the ones that leave you with different thoughts or possible interpretations that mean the most. Another thing that I took away was that you sometimes should not compare memorials. Sometimes they are incomparable. We need to view each memorial on its own and try to understand it’s meaning for itself.